Noone knows how far away we are from artificial general intelligence. It can happen soon. It may happen later. It might never happen. It is however already granted that machines will learn to drive, cook and code. If you are in danger of being replaced by a machine because your job is related to any of the above skills (excluding driving and cooking), this workshop is for you! According to our rough calculation, in the web, you can find seventy-three thousand, four hundred and eighty-three deep learning workshops. We think some of them have a lot of great content, some of them are really fun to follow, so if you have spare 4-5 years of your life, we strongly encourage you to go through them all and pick the most valuable parts for you. As an alternative, you can join our workshop. We will learn by exploring real-life cases from computer vision and data mining, looking for solution in a natural way (brainstorm, check off-the-shelf solutions, understand and improve or build own components from scratch when necessary) We will not be slapping layers’n’stuff with our fingers crossed. We will be choosing or building our solutions with full awareness of what problems are being tackled and what the specific components and layers are offering us. There will be no strong focus on a particular framework. 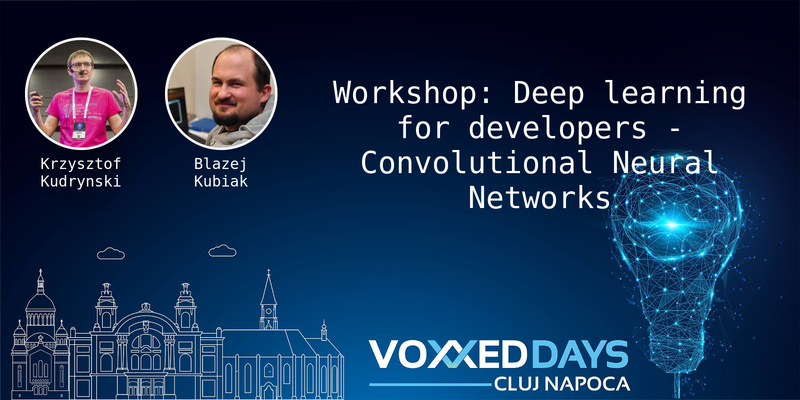 We will be working in Python and Java mostly with Keras, Tensorflow, DeepLearningForJ and Caffe (sorted by level of attention) You will be guided by two passionate guys with over 5 years of professional, academic and hobbistic experience in various AI projects, already recognized by the international conference community (top voted talks at Devoxx Belgium 2016 and 2017, Devoxx Poland 2016 and 2017, Geecon 2017 and Mobilization 2016, guest speakers at NVIDIA GTC 2016 and more). This workshop is for developers who wish to gain or improve their skills in using state-of-the art artificial intelligence in practice. For best experience, attendees should be familiar with Python and Java. Basic knowledge of neural networks would be a plus. However, all the material covered in this workshop will have a proper, brief introduction so that both beginners and returning experts can keep up. You can use IDE of your choice. We will be using PyCharm and IntelliJ.